Blazing sunshine and a 10 knot southeasterly greeted the 59 boat Moth Nationals fleet at Stokes Bay Sailing Club. A number of new innovations were on display including Dylan Fletcher's solid wings, Mike Lennon's boom fairings and James Phare's double-wand. Straight from the off the action was tight at the top. Dylan Fletcher made his intentions known straight away with a port-tack flyer, going on to take the race win. Fletcher said after the race, "It was good fun. I started on port and crossed the fleet and that's always a good feeling and then just tried to position myself between the next mark and the fleet, especially Rashley as he's pretty hot on Stokes Bay - it's the first time he's lost a race here in 6 months - so I was just trying to stay ahead of him." On his solid wings he said, "It makes a few manoeuvres harder, like the gybing in the light winds, but I seemed to be going quite fast in the first race, so happy days with that." Chris Rashley was hot on Fletcher's tail, but couldn't find the extra gear to get past his rival. 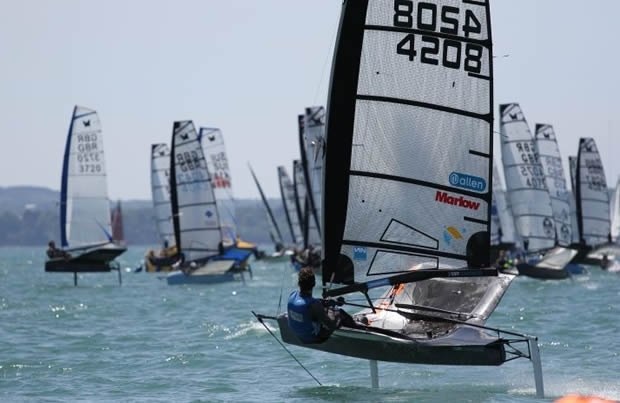 "Dylan got a great start on port and went out to the right hand side in a little bit more tide and possibly had a little bit more pressure out there and so he came out 80 to 100 metres ahead when we came to our first cross. He then just extended up the beat, made some better decisions than me and was going a little bit quicker. I reeled him in a little bit on the run but nothing significant to get close enough to him." On whether the solid wings the difference Chris said, "I don't think it was anything to do with the solid wings, if I made my boat with solid wings I think I would probably go exactly the same speed as I am now. It's a combination of a couple of things; his boat is aerodynamically very clean, there's a lot less stuff on it than on mine, and that's obviously quite nice when you're going upwind in breezier conditions, and I think the other advantage is that you sit a lot higher so you've got a lot of extra righting moment when you're in powered up conditions like we were in that first race." Behind the leading pair, defending champion Mike Lennon came in third for a solid start to his series. "It was alright, I've got good pace on the boats around me. It's tough racing but it was a cracking sail, perfect conditions while it lasted," he said. On his new boom fairings Lennon continued, "You're into subtleties here, you're not going to see a sudden jump in performance, but I think it's all these little things that add up after a while. I've got 2mm shrouds and lots of tiny little details and you just hope it all adds up to a little bit more of a gain - on their own they're barely noticeable." Jason Belben who finished 4th in the first race said, "It was a good race for me, I'm happy with that. I rounded the first mark about 6th or 7th and gained on the second beat so pretty pleased. I went out to sea and caught the right shift and took a few boats there. Unfortunately I went there again in the second race and it cut out on me. I've gone for a few mods on the boat; bowsprit, lower rig, new Lennon sail and that's all working really well." Luckily for Belben, and a number of other sailors on the right, the second race was abandoned after the wind switched off, leaving vast holes on the course and the Moths low-riding into the shore. The committee kept the fleet postponed until 4.15pm when they called it a day. A few Moths went to buzz the Emirates Team New Zealand AC45 which was training in the Solent ahead of America's Cup World Series Portsmouth.